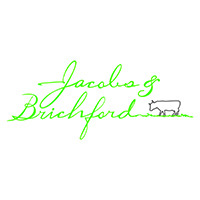 Contact Jacobs & Brichford Today! Since the early 1800s, the land of Jacobs and Brichford has been home to a family farm in southeast Indiana, nestled in the Whitewater River Valley. All the milk used in their cheese is produced on their farm from grass-fed, Jersey, Normande, and Tarentaise cross cows. They also have a small flock of hair sheep and a drift of Berkshire hogs. They operate a seasonal dairy, following nature's rhythm of milking (in a New Zealand style outdoor parlor) and move their cows through fresh pastures each day. They manage their resources meticulously, use limited inputs, and create all-natural, grass-fed milk and cheeses of the highest quality. The first cheeses were made by Jacobs and Brichford Farmstead cheese in ​May of ​2012. Beginning with Everton, Briana and Ameribella, Matthew honed his skills and marketing the cheese began in earnest. During the following five years, six more cheeses have been added to Jacobs and Brichford's production. They include Adair, Phetamias, Tomme de Fayette, Briana with Truffles, Everton Premium Reserve, and JQ. Jacobs and Brichford Cheeses have won several awards ​in their cheese categories. 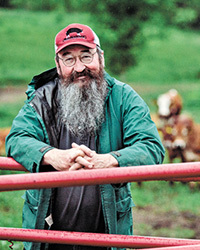 Matthew started farming as a teenager in central Illinois and moved to his parent's family farm​ in Indiana​ in 1980. Joined by his wife Leslie, they began caring for the land and looking for a way to bring value to production. After practicing sustainable crop farming that included ​ridge till planting, Matthew decided to change over the farm to being 100% grass and raising dairy cattle. He began the dairy in 1995, still providing a bit of grain to the cows, but quickly switched to only raising 100% forage-fed cows. He was ​marketing milk through a co-op for 17 years. ​With the beginning with the dairy operation, Matthew began researching cheesemaking. He attended several cheesemaking schools and workshops along with a trip to France to visit farmstead cheese production in the Normandy, Brittany, and Savoie regions. Matthew then hired a cheese consultant to help him design and plan his building and his cheesemaking business. Briana is a semi-firm, smear-ripened cheese, dense and easily melted. It is carefully aged for a minimum of 90 days to develop a wonderfully complex flavor. Briana with Truffles is semi-firm, smear-ripened cheese, dense and easily melted, made with Italian truffle oil and black truffles throughout the cheese. Everton is aged 8-12 months, styled after Alpine-style cheeses, with a firm, creamy texture and a savory, sweet flavor that gets sharper with age. Everton Premium Reserve is Everton carefully aged for a minimum of 18 months, fully developing the sharper flavors, yet retaining its subtle sweetness. Our version of a traditional tomme, is a grassy, complex cheese that is in a wheel weighing about eight pounds and is 8 inches across the top. The cheese is allowed to naturally age, with the rind going from slightly mold covered to speckled and semi-firm.